Hello Crafty Friends! 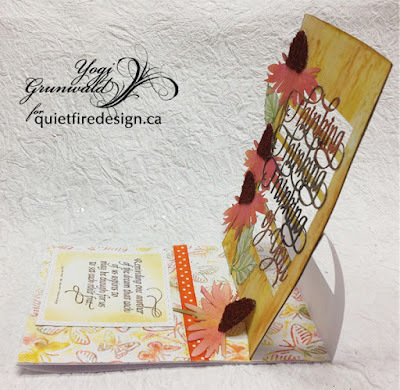 Kathy Jo here sharing a card using a "love"-ly Quietfire Design stamped sentiment and an equally lovely A Way With Words die. The sentiment is so heartwarming, "I love you not only for what you are..."
It was stamped using Jet Black Archival Ink onto ivory card stock and die cut using Spellbinders Opulent Ovals. 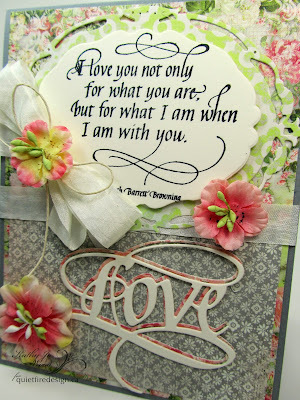 While making the card I could not help but think of my sweet hubby (big smiles). The patterned papers were from Bo Bunny's Soiree collection. 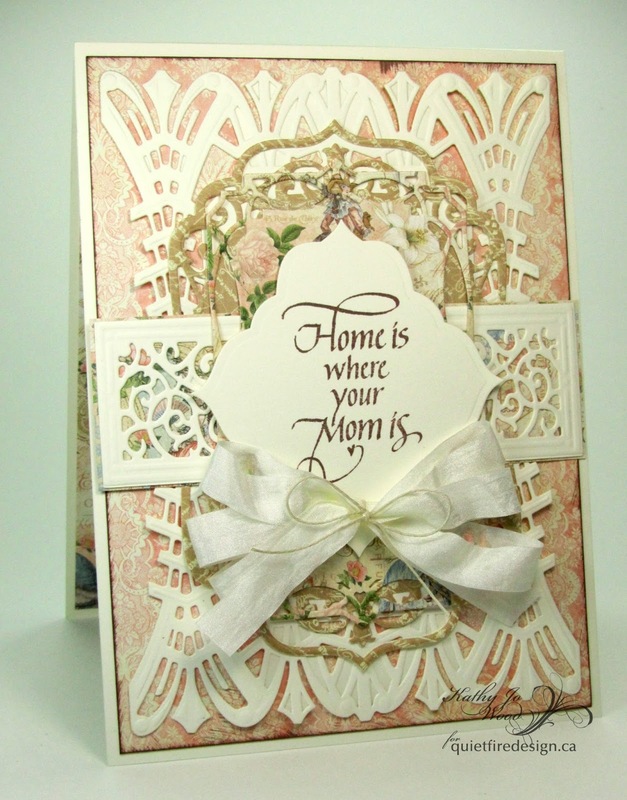 Ivory and gray card stock was also used. 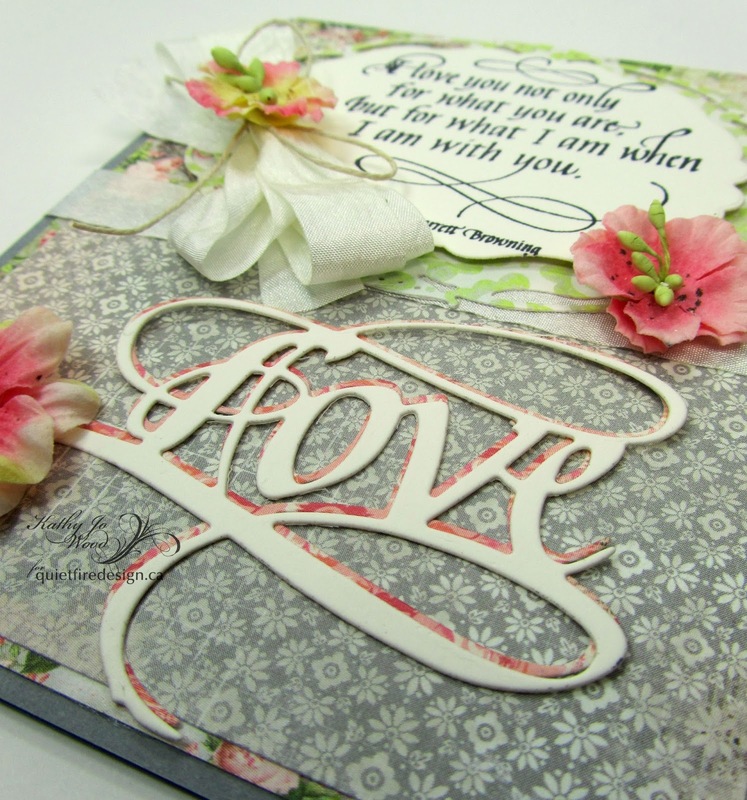 Behind the ivory die cut Love was a patterned die cut Love. So happy! 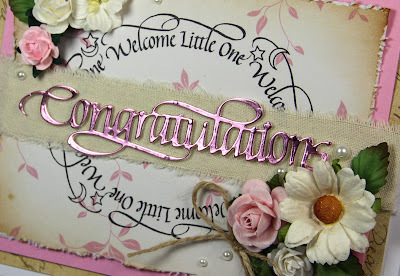 A few wee flowers and triple ivory wrinkle ribbon and the card was completed. SALE ALERT! 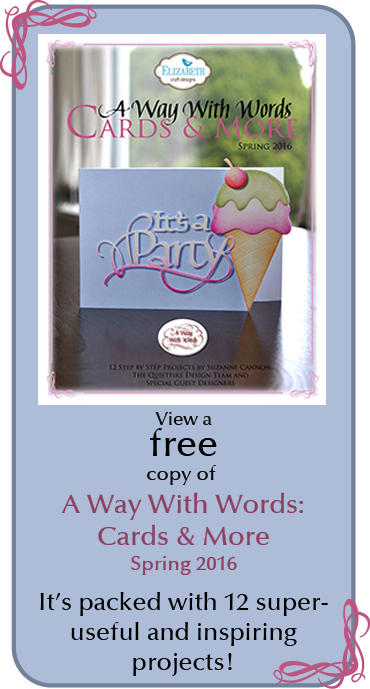 All A Way With Words dies are all 15% off...woo-who!! 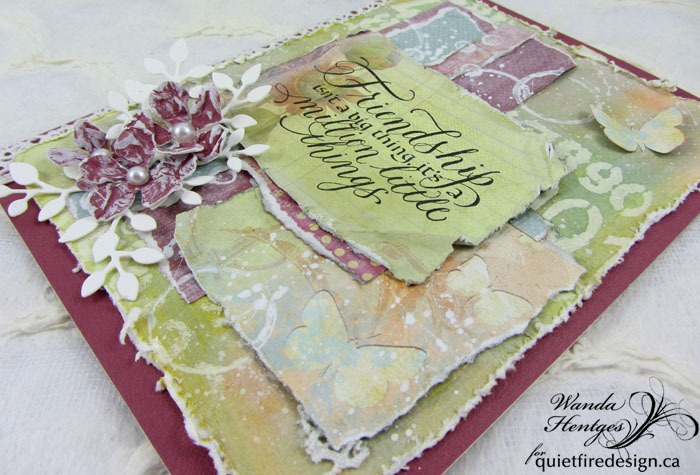 Hello, Connie Nichol here today with a scrapbook layout featuring two A Way with Words dies and a Quietfire Design stamp. 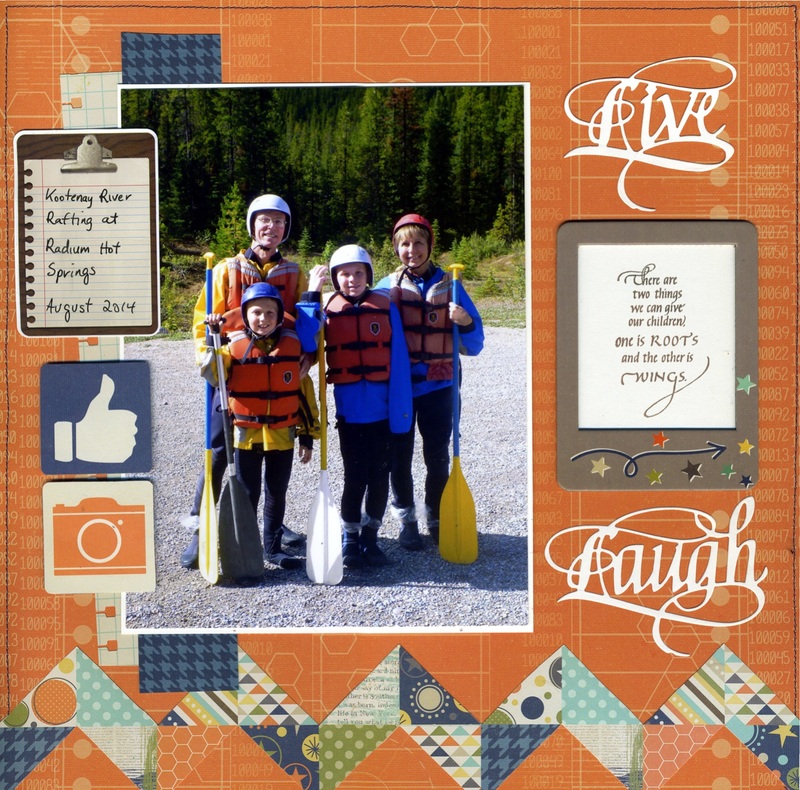 The words 'Live' and 'Laugh' are perfect accents to many scrapbook pages, especially those that feature whitewater rafting. LOL. The Rocky Mountains are about a four or five hour drive from my house and we try to get to Radium Hot Springs, British Columbia every couple of years. I really love it there. The last couple of trips my family has spent a day on the river with Kootenay River Runners. So much fun and it is great to introduce our boys to all sorts of different experiences. Hello!! It's Wanda here today. I can't believe how quickly this year is flying by. It's almost May!!! How did that happen! With Mother's Day a short 1 1/2 weeks away (in the US) some of you might be needing card ideas and so I've used a wonderful Quietfire Mother-themed stamp. You can find this and others under the topic, Mother... Here. If, like me, your mother has passed away, this card easily translates to any theme such as Happy Birthday, Happy Anniversary... etc. 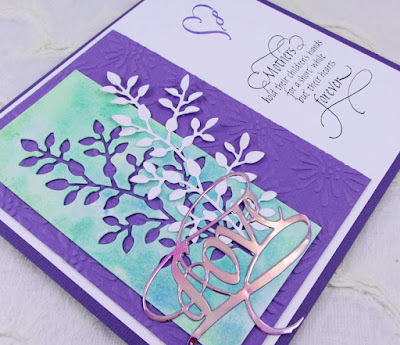 I love this leafy branch die, have used it several times and sometimes keep the negative such as the one used on this card that is watercolor paper. I put some Distress Ink on my craft sheet, sprayed on some water and then dipped the paper in the color. Since I only had the negative, I needed to cut a branch and did that from white cardstock so I could offset it from the negative piece. 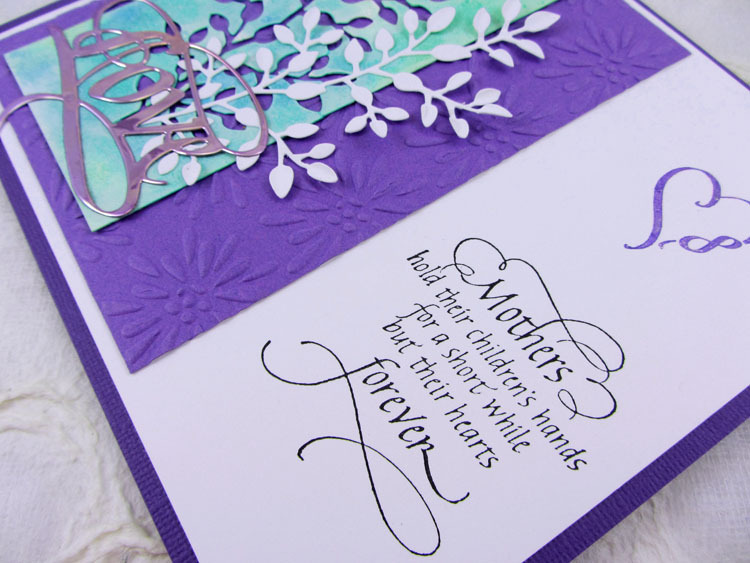 The purple layer is dry embossed with a folder. "Love" is cut from Shimmer Sheetz. 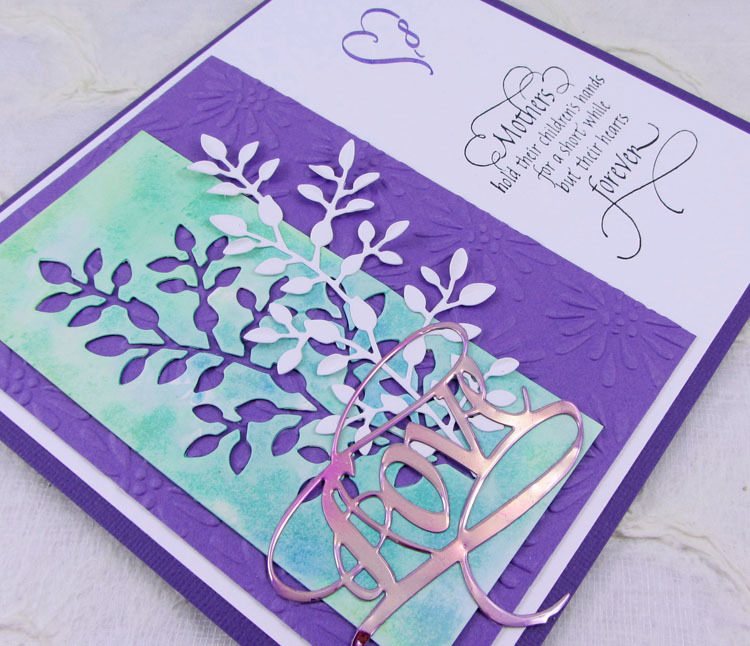 The heart (Calligraphic Love Bits stamp set) is stamped with purple ink and I've brushed Wink of Stella (Gl. Clear) over the purple ink. The quote is stamped with Jet Black. A pretty simple card with a big punch I think. 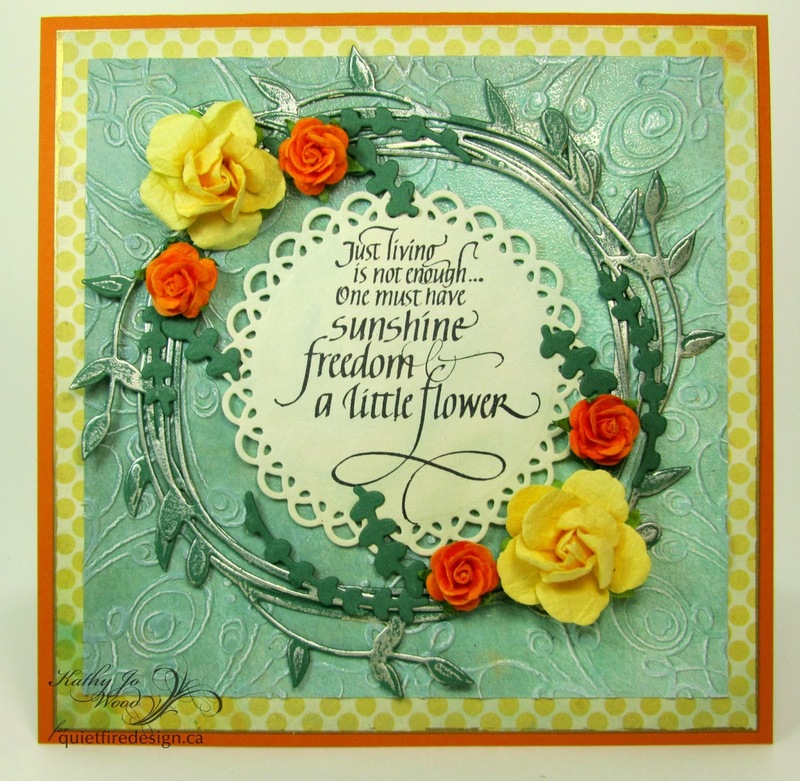 Hi Everyone it's Teresa here today with a share using one of the beautiful new Way with Words Thank you dies and the Thanks Cuddlers mounted rubber stamp set. 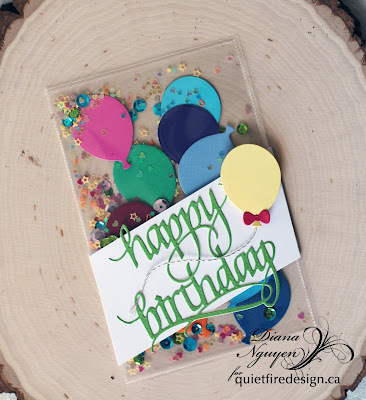 I wanted to keep the card really simple so I used a really simple dotted pattern paper to make the base of my card and layered it with 3D foam squares to make it stand out more with the white matting on the top piece. 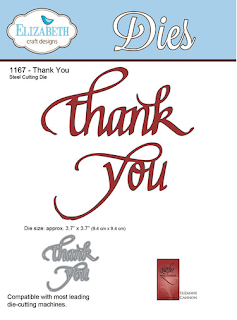 We needed to match a die with a saying so i found this wonderful set of Thank you sayings and it fit perfectly in the bottom corner. The ink didn't take on the embossed dots like i wanted it to but i think it looks really nice and works really good with the die cut words. 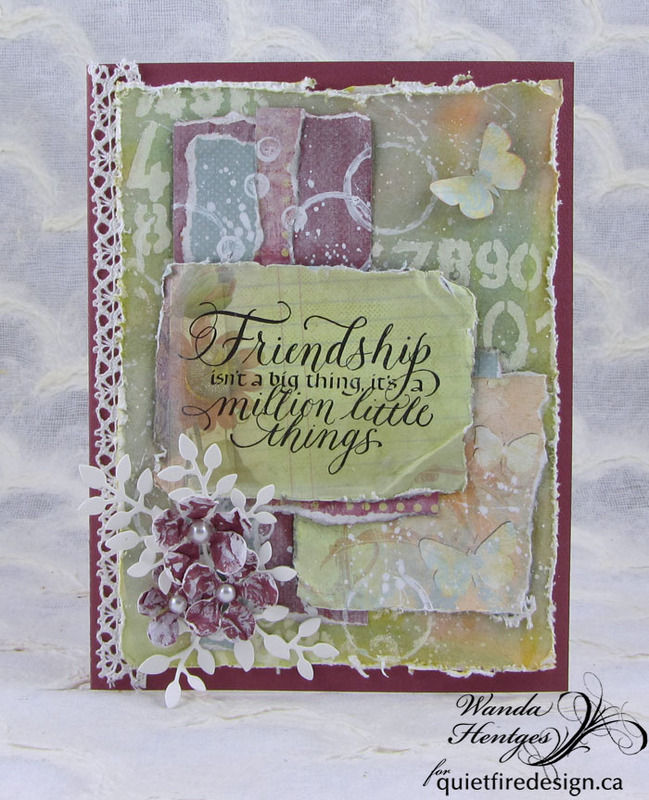 Here is a quick peek at the stamp set and all the other sayings that come in the set. It's really nice. There are so many choices to chose from. 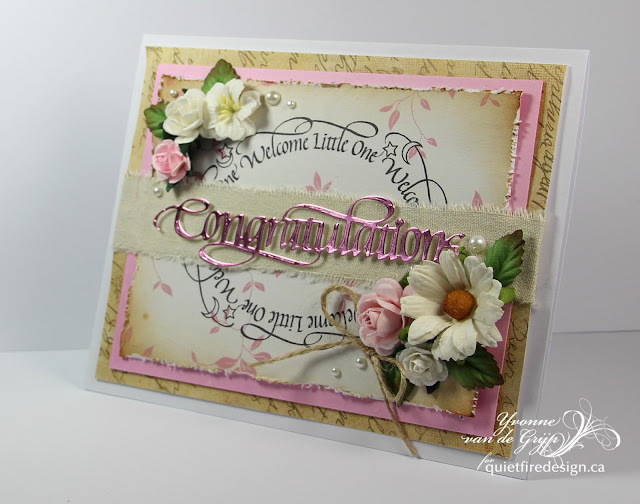 the other Way with Words die here and have fun crafting and making pretty things with them! Yvonne here with a new card combining a gorgeous Quietfire Design stamp with a Quietfire Design-ECD die-template. 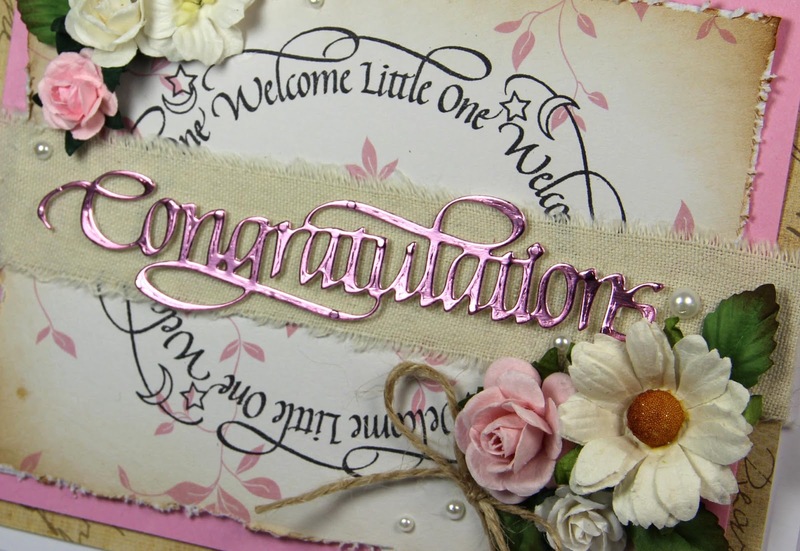 Since the card is in pink it's meant for a newborn baby girl. We have a granddaughter on the way (end June) and that was my inspiration for this card. Since I am so happy about this, I would like to give away this card to a randomly chosen commentor on this blogpost. 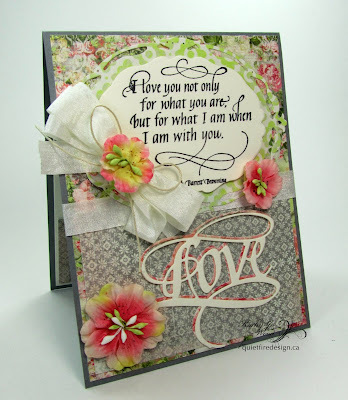 So...if you would like a chance to win the card, simply leave a comment under this blogpost. My next Quietfire Design blogpost will be on May 5th and I will announce the winner in that blogpost. There are several layers to the card. 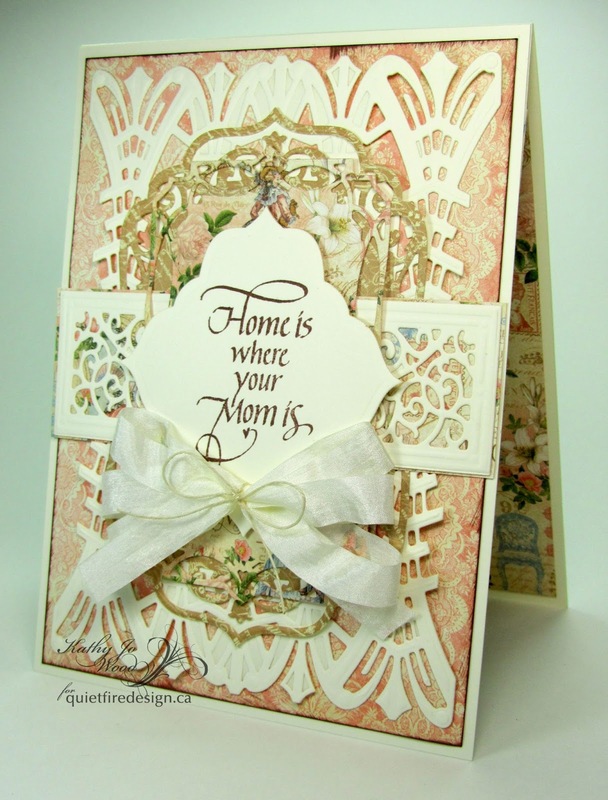 Here are the layers starting with the card base and working up to the sentiment: ivory tent fold base, Graphic 45's Gilded Lily pink patterned paper edged with gold, ivory card stock die cut (Spellbinders Astoria Decorative Accent), brown patterned Gilded Lily die cut (Spellbinders 5x7 Elegant Labels), Gilded Lily die cut (Spellbinders Art Deco Astoria), ivory card stock die cut (Spellbinders Swirl Bliss band) and mounted on Gilded Lily and finally the lovely stamped sentiment die cut (Spellbinder Victorian Garden Fancy Diamond). 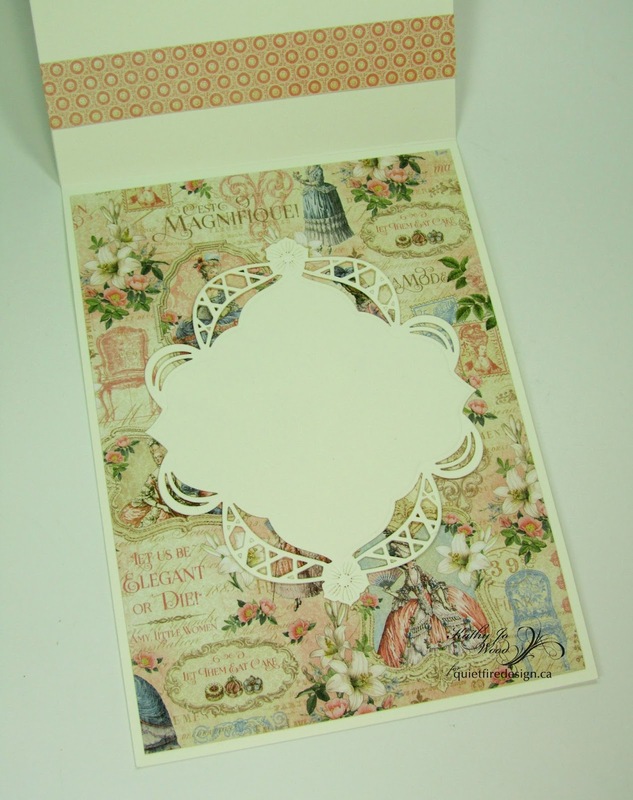 The inside of the card has more Gilded Lily and die cut ivory card stock (Spellbinders Decorative Elements Fancy Diamond). Thanks so much for stopping by! 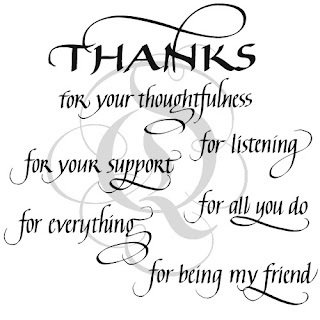 I do hope you enjoyed the card. 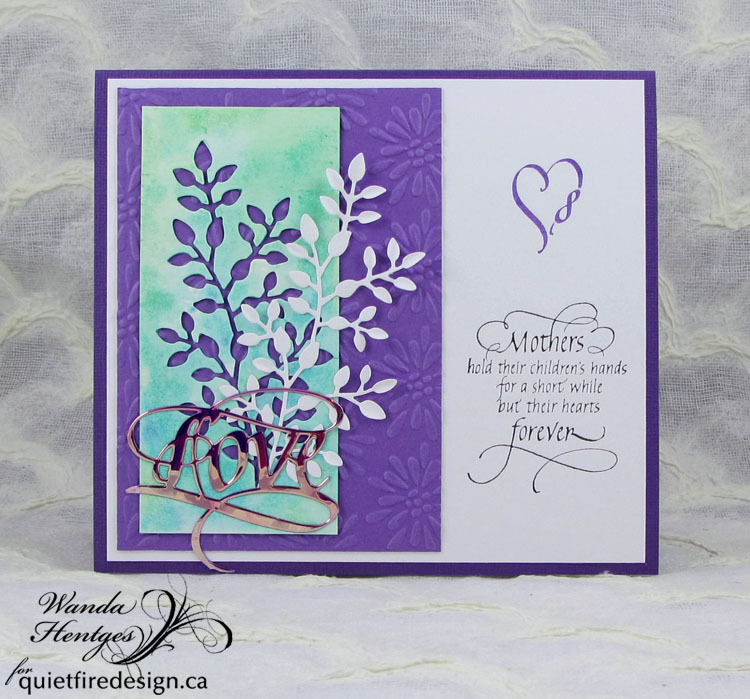 Feel free to check out the other beautiful Mother's Day stamps from Quietfire Design. 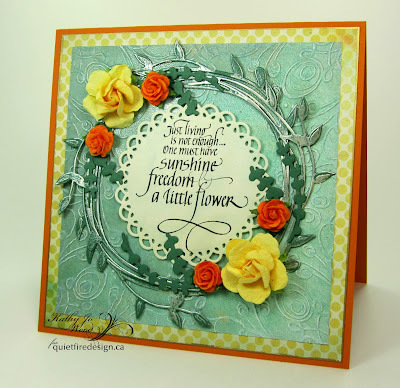 Suzanne Cannon posted a project on the Elizabeth Craft Designs blog featuring hand-embossed Shimmer Sheetz surrounding a die cut. 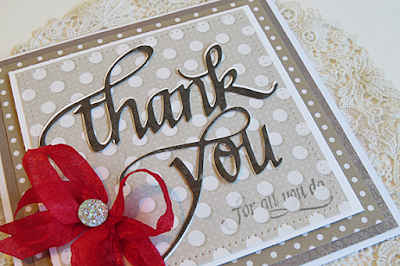 She used a stylus tool to draw de-bossed lines and doodle patterns around the sentiment. I thought it would be fun to take that concept in another direction. For my project, I used a piercing tool in addition to a stylus and did most of the work on the BACK of the Shimmer Sheetz. Pierced holes form a raised dotted pattern on the front. 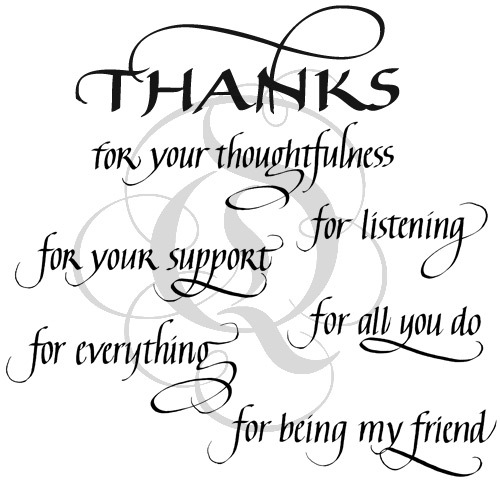 The stylus, in turn, creates de-bossed dots that help to flatten the Shimmer Sheetz around the word ‘Thanks’ since piercing will distort the Mylar and cause it to curve. This is not a problem with the butterflies so there is no stylus work on those. Change the color combination to suit your taste, and if you don’t have alcohol inks on hand to alter Shimmer Sheetz for the butterflies, skip that step. 1. Die cut the word ‘Thanks’ from Shimmer Sheetz or heavy cardstock that has Clear Double Sided Adhesive on the FRONT side. Adhere the word to the back of a piece of Pink Iridescent Shimmer Sheetz (or whatever color you’ve selected). 2. 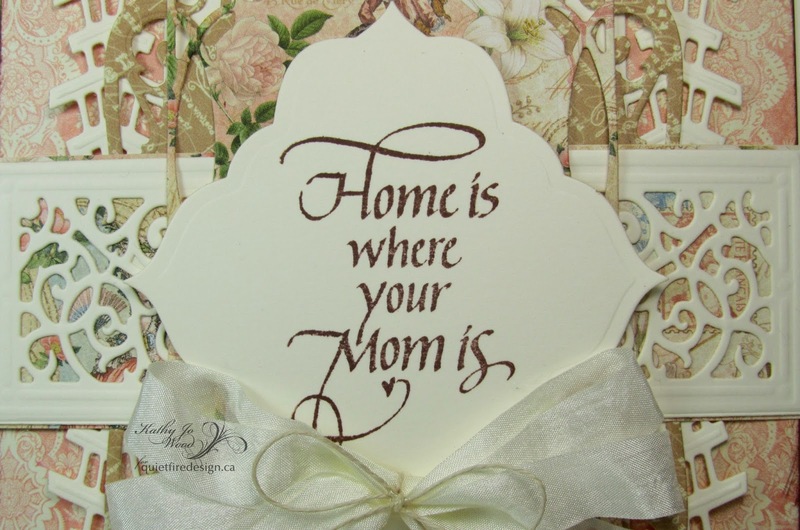 Place the piece on a soft mouse pad or piercing pad and use a piercing tool to create a dotted outline around the word as shown in the photo above. Pierce larger holes in some of the areas, smaller and more closely spaced holes in other areas for variety and interest as shown in the photo below. 3. 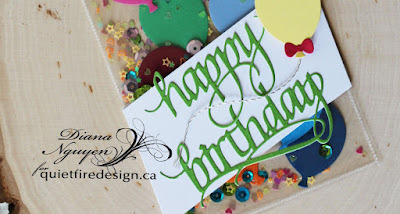 With the piece facing up, use a craft knife to scrape lines on the inside of each letter (lines will be white, the core color of the Shimmer Sheetz). Use a stylus tool to create randomly spaced de-bossed dots all around the word as shown in the photo below. Cut a rectangle measuring 4.25” x 2.5”, back with Clear Double Sided Adhesive Sheet; mat to Perfect Pink Soft Finish Cardstock, leaving an eighth-inch border. 4. Alter a piece of Pink Iridescent Shimmer Sheetz with alcohol inks (Optional). Put black outline butterfly peel-offs on the BACK and selectively pierce around and inside the outlines. No need to pierce all of the pattern lines. Pull away and discard the butterfly peel-offs. 5. Turn the Shimmer Sheetz right side up and use fine pointed scissors to hand cut around the butterflies. Bend wings upward as shown below. 6. Emboss a 5.25” x 4.75” piece of Light Pink Iridescent Shimmer Sheetz with the butterfly folder. Lightly sand to tone down the sparkle and bring out the white core color. 7. Cut a 5.75” x 12” piece of Rosebud Soft Finish Cardstock. 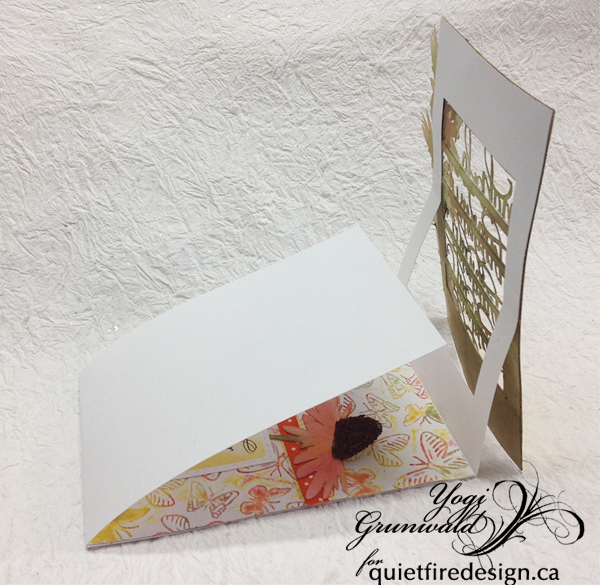 Score at 6”, fold in half for card base (fold at left side). 8. Assemble the card front as follows: Embossed Shimmer Sheetz rectangle, centered left to right, a quarter-inch down from top edge; greeting (foam tape beneath rectangle for added dimension); butterflies (secured with small slivers of Tombow Power Adhesive Tabs, ideal for holding Shimmer Sheetz to Shimmer Sheetz). 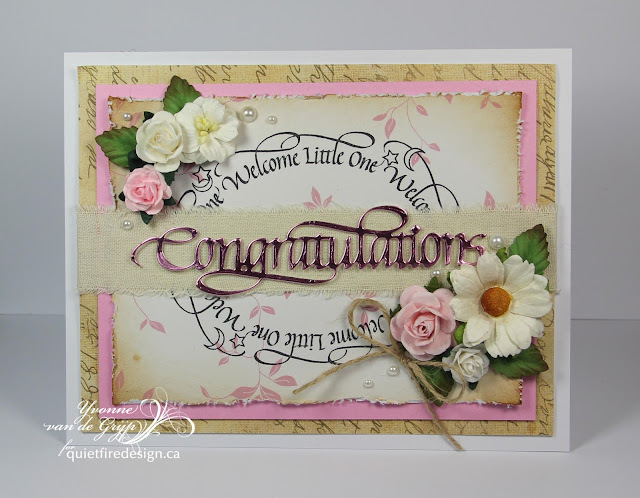 It was stamped using Jet Black Archival Ink onto ivory paper from Basic Grey's Serenade collection. It was die cut using Spellbinders' Stately Circles. Hello, Connie Nichol here today with another scrapbook layout designed around a Quietfire Design stamp. Today I am using the ‘Wine is Sunlight’ stamp from one of my favourite stamp sets. 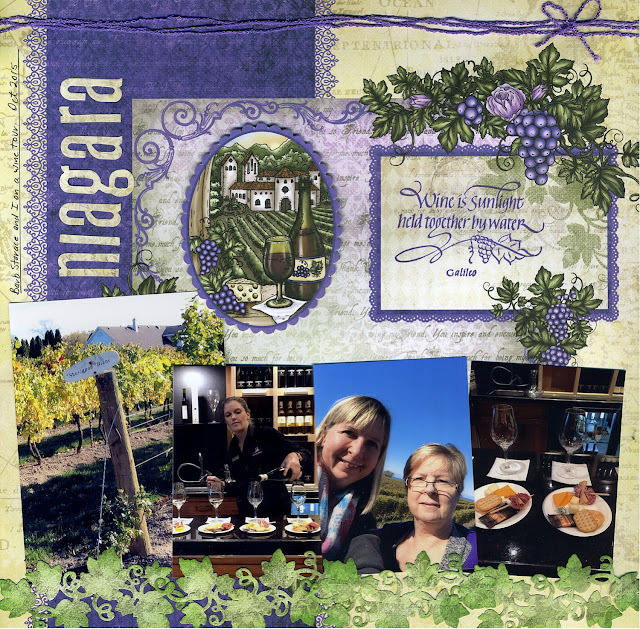 It is a perfect accent for photographs I took while I was on a wine tour near Niagara Falls last fall. This area of Canada is simply beautiful and there are many many wineries to visit. 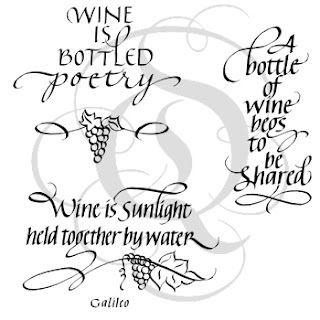 The ‘Wine is Sunlight’ stamp is from a set of four stamps, all of which would be wonderful for embellishing scrapbook layouts about wine tours or getting together with friends. Or,these stamps make great tags for wine bottles given as a hostess gift or on invitations to wine and cheese parties. Imagine the possibilities! Supplies Used: Quietfire Design stamp, Heartfelt Creations patterned paper and vine die, Sizzix alphabet die, Clearsnap Ink, May Arts ribbon. Happy Mid-Week!!! I hope things are going well for you!!! 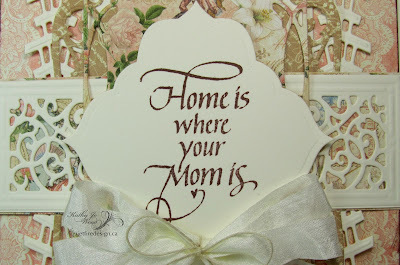 It's Wanda here today and I decided to get a little shabby chic for this post. 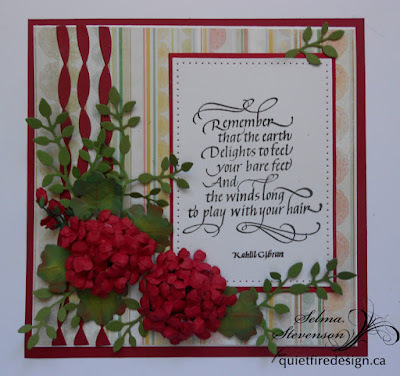 I've combined one of Quietfire's wonderful friendship quotes with a self done background, some 7 gypsies paper, and some die cuts. 1. 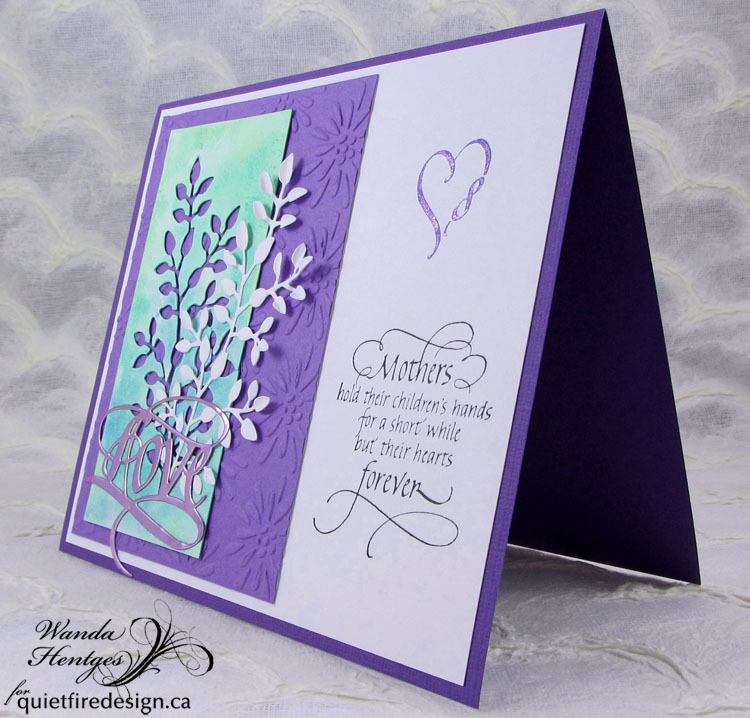 Create a 5" x 6 1/2" side-fold card from Misty Mauve. 2. Cut Watercolor Paper 4 1/2" x 6". Stencil numbers with gesso in three areas and let dry. 3. Put Shabby Shutters, Wild Honey, and Fired Brick on craft sheet, drag stenciled paper through color, spray water on paper to help color move tipping paper to allow it run, blot over stenciling a little and dry paper. 4. 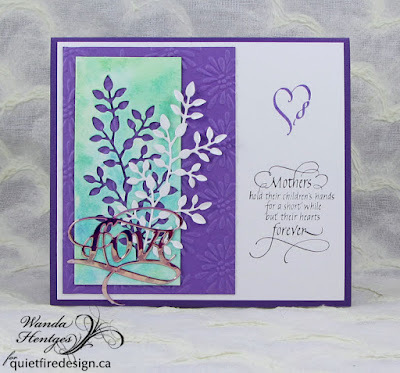 Use dauber top to add Bundled Sage across paper and dry. Use dauber top to rub Picket Fence across paper and dry. Distress edges. 5. 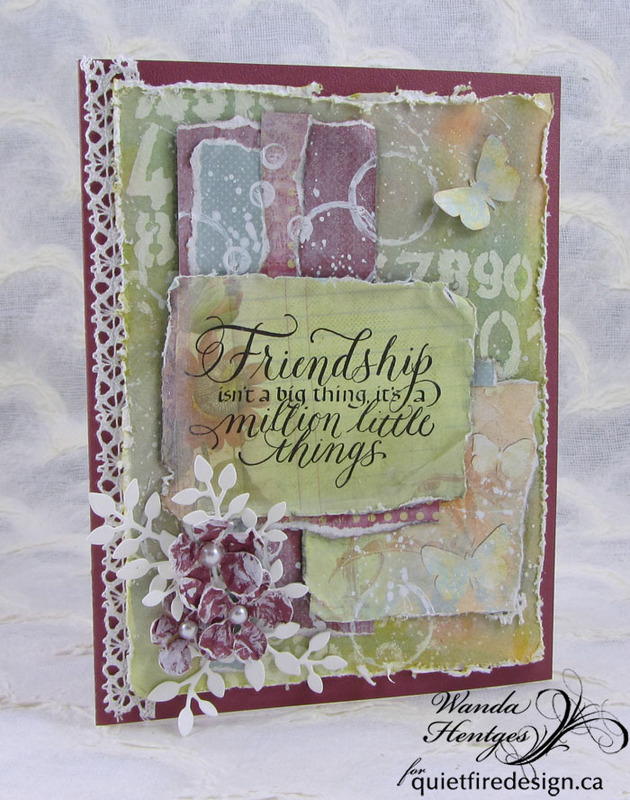 Choose patterned paper from book, cut/tear pieces to use, use dauber top to rub Picket Fence over papers, splatter patterned papers and watercolor paper piece with gesso thinned with water. 6. Choose paper to stamp quote on. 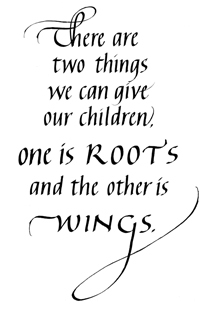 Stamp quote with Jet Black ink. Rub Picket Fence around edges. Tear and distress edges. 7. Attach papers together. 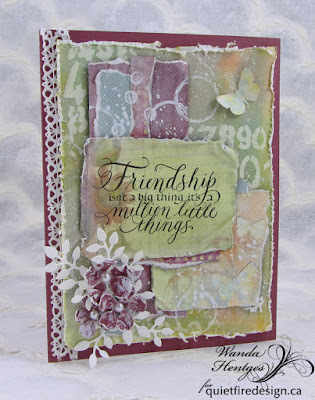 Stamp gesso circles. I used an empty paint bottle cap and the end of an eraser to stamp the circles. 8. 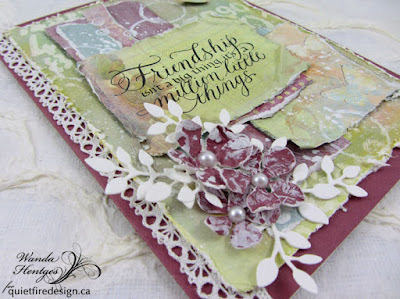 Attach a piece of lace along left edge of layered papers and then attach stack to folded card. 9. 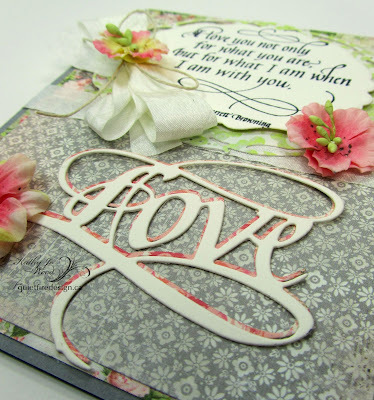 Add some shading along the edges of layered papers by scribbling pencil along edge and activating with a water brush. 10. 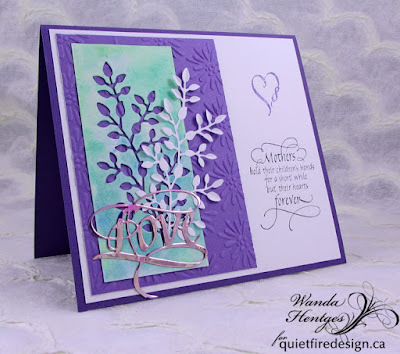 Die cut leaves from watercolor paper. 11. 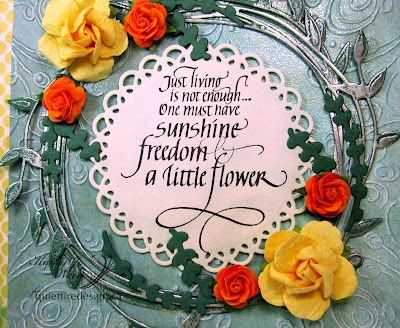 Die cut flowers from Misty Mauve, spray with just a bit with water, crumple flowers, carefully uncrumple, dry with heat tool, dry brush some gesso on petals and dry. 12. Attach leaves and flowers as shown adding pearls to center of flowers. 13. Cut a butterfly from pattered paper and attach to card. Add a scrap of lace under paper layer in lower right corner.